BookBrowse interviews An interview with the Foster Book Group of Rhode Island about all aspects of their book club. Ginny, I am so excited to hear about the Foster Book Group! Please tell us a bit about you all. We call ourselves the Foster Book Group because most of us, but not all, live in Foster, Rhode Island. A rural community of about 4,000, Foster has dirt roads, lovely woods, and a sense of privacy that make it a desirable place to live. However, the very things that make our town special can cause a feeling of isolation and our book group grew out of the desire to have social and intellectual interactions. Our fourteen full time members and two associate members are educated women in their fifties and sixties who love to read. Do you all like to read the same kinds of books? We may appear to be homogeneous on the surface but there is a surprising diversity of opinion. Our nurse practitioners choose books that often represent their unique perspective, for example, Birth by Tina Cassidy or The Healing of America by T.R. Reid, Mountains Beyond Mountains by Tracy Kidder or The Spirit Catches You and You Fall Down by Anne Fadiman. Our teachers often choose classics such as East of Eden and The Grapes of Wrath by John Steinbeck, My Antonia by Willa Cather or Tender is the Night by F. Scott Fitzgerald. We have artists and businesswomen in our group as well. The books they suggest can be anything from Mornings in Jenin by Susan Abulhawa or The Perks of Being a Wallflower by Stephen Chbosky. Time and again members remark that the group has “spoiled us” for the formula writing that floods the market today. We have become more discerning readers who want more from a book than pure escape. We all acknowledge that the “mind candy” of the formula books provides a pleasure to be enjoyed but we no longer crave a steady diet of it. In addition, we all agree that we have read books that we would never have chosen if they hadn’t been a book group selection. The books enrich our lives and are sometimes life changing. Poisonwood Bible by Barbara Kingsolver is an example of this type of book. However, these details don’t really capture the special warmth, tolerance, trust, and respect that have grown over the years among our members. Is there something in particular that makes your group special to you and/ or that you think might be different from other groups? We feel that we are unique but I wonder if that is one of the unexpected gifts of a book discussion group. We’ve been meeting for twelve years, but the group has gone through many changes. We all love to read, and laughter always spills over at some point in the discussion. Others overhearing us often say we are having way too much fun to be discussing a book. We’ve also shared the sadness and grief of serious illness, and death. In those times, we make food, send cards, emails, and drop by for visits. We started as a group of friends and acquaintances, but sharing books and our lives has allowed us to forge a strong enduring bond. I love that idea of the unexpected gift a book group can offer. I think you are spot on about that, and I bet it is even more so for your group because you all are so open to it. I'm curious…how did the group get started? Always a good place to start something! —and wine has been a part of every gathering since! Two good friends and I were sharing a glass after a Christmas craft fair at the local country club and bemoaning the fact that we hardly got to see one another because our lives were so filled with work and family. One friend suggested forming a book discussion group. If we met regularly we could share our love of reading and our lives. To make it happen, we set a date for our first meeting and started contacting people who we thought would like to join us. I offered to be the facilitator since I was the local public librarian and was leading a book discussion group in my library at the time. Another friend offered her home for the first meeting. I had just finished reading Into Thin Air by John Krakauer and suggested that since it was such an enjoyable, compelling read we should start with it. The three of us spent the next two months contacting people who we thought might like to join us and our first meeting was in March of 2001. Tell us about your meetings. The person who hosts the meeting also chooses the book, so the hostess begins by explaining why she thought the book would be good for discussion, and then we all join in. We don’t necessarily agree but we all respect the right of others to disagree. With ten or fifteen strong, articulate women talking away, keeping the discussion on track can be a challenge. They laughingly accept that I will stop discussions between individuals and ask them to share their ideas with the whole group. Are you the teacher of the group?! I’m an old English teacher as well as a librarian. I often remind them when we’ve gotten off the track and the group good-naturedly returns to the discussion of the book. Sometimes I use the reading guide questions, sometimes not. I do research on the author and the reviews for each book. I usually reserve any personal comments to the end of the discussion since I’ve had the benefit of my research. One time, however, I got so frustrated with Ehrenreich, the author of Nickel and Dimed, that I threw the book across the room. Group members find that memory very funny and often remind me of my impatience since it was so out of character for me. The discussion naturally winds down; we have dessert, and head home after two to three hours. One of our members keeps track of the books and authors we have read and sends everyone reminder emails after the meeting and sometimes a few days before the next meeting. Tell us about the sort of books you read. We’ve read books from every genre. Fiction, current and classic, is the biggest category, but we have also read a significant number of non-fiction books, some poetry, essays, short stories, children’s and young adult books and plays. Some of the best discussions were, not surprisingly, about books that caused some disagreement. If everyone absolutely loves a book the discussion is not as varied. There are always exceptions, of course. We all loved The Grapes of Wrath by John Steinbeck but we remember it as an amazing discussion. I had brought pictures by Dorthea Lange from that period to go with the discussion and several members remember them 10 years later. What were some of your favorite discussions? Members remember The Cry of the Kalahari by Owens, The Immortal Life of Henrietta Lacks by Rebecca Skloot, The Glass Castle by Jeannette Walls, The Whistling Season by Ivan Doig, The Poet and the Murderer by Simon Worrall, Water for Elephants by Sara Gruen, Three Junes by Julia Glass, and Middlesex by Jeffrey Eugenides as particularly good discussions or books. And how about some of your hardest? The Left Hand of Darkness by Ursula LeGuin, was too strange, All Together in One Place by Jane Kirkpatrick was poorly written and trite, and Jana Kolpen’s Secrets of Pistoulet really didn’t go anywhere. For these reasons, the group members thought these books really bombed. The discussion of The Lovely Bones by Alice Seabold was memorable in a negative way. It was so disturbing to some members that they had to leave the discussion. If our reading has changed in the last year, it is that we chose slightly more non-fiction such as Unbroken by Laura Hillenbrand, and Nothing Daunted by Dorothy Wickenden. The upcoming selections for this spring are The Round House by Louise Erdrich, Cannery Row by John Steinbeck and The Life and Adventures of Nicholas Nickleby by Charles Dickens. Any special events you’ve held, visits taken, activities and so forth? Generally we don’t socialize as a group outside of our monthly meetings but we have done some things together over the years. In 2008 we read A Raisin in the Sun by Lorraine Hansberry together and on a later date went as a group to a restaurant for dinner and to see the local production of the play in Providence at Trinity Theatre. In addition, we’ve watched the DVD’s of A Passage to India and A Room With a View after reading the books by Forester, as well as Tender is the Night by F. Scott Fitzgerald. One August weekend we took the three-hour trip up to Sebago Lake in Maine to the lake house of a member. Along with blueberry pancakes and lounging on the beach, we had a wine tasting and a discussion of Lisa Scottoline’s Why My Third Husband Will Be a Dog. The neighbors still ask when the group is coming back. Our laughter echoing over the lake made a lasting impression. 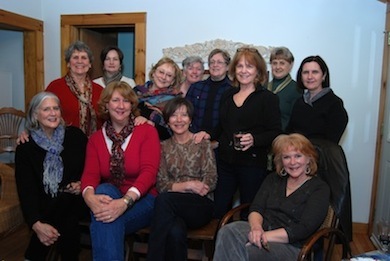 Usually we celebrate our becoming a book group with a potluck and discussion in April at member’s home. But, in 2006 we gathered at 9 Cooks here in Foster where we prepared and cooked a dinner together and then discussed Julie and Julia by Julie Powell. 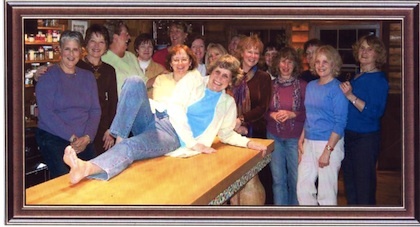 I don’t know whose idea it was but in our group photo for that year, I’m stretched out on the prep table with the group gathered around. The choice of Guernsey Literary and Potato Peel Society by Shaffer & Barrows was actually the stimulus for three memorable events. First, the hostess made an official potato peel pie and it tasted really good. Second, we met another evening and created a centerpiece of books from cereal boxes for the luncheon held by Reading Across Rhode Island. Third, we went as a group to the luncheon and enjoyed Schaffer’s speech about her aunt and the book she finished when her aunt was too ill to write. We still occasionally talk about saving our pennies and taking a trip to the Guernsey islands off the coast of England. I fondly remember a meeting when three mothers came to our discussion. We had read Katherine Graham’s Personal History. In their late seventies and eighties, these women provided an interesting perspective to Katherine Graham’s life and times because they had been alive for some of the events. For our December meeting we tend to dress with a theme. One year we all wore sparkles, and this year we came in our Christmas tree skirts. Local authors Kim Fusco (Tending to Grace, The Wonders of Charlie Anne, and Beholding Bee) and Lucinda Landon (The Meg Mackintosh Mysteries) have come to meetings to share their writing process and inspiration. We are currently planning a trip to Mark Twain’s home in nearby Hartford and another weekend in Maine this summer. You have done so many interesting things together! Wow! Thank you for sharing all of that. It truly sounds as though you are a close knit group. So for a final question… do you have advice for other book club groups, so that they can achieve what you all have? We now do a number of things that have evolved over the years to help the group run more smoothly. Since at least half of the reason we get together is to socialize, it has worked for us to allow 30 to 45 minutes at the beginning for catching up. We tend to be more focused on the discussion if we do. Regularity has also been helpful. Our meetings are at the same time on the same night of the week, same week of the month. In these busy times, it helps. We try to choose selections and meeting locations three months in advance and we attempt to have books that are available in paperback or through interlibrary loan. We ask that the person choosing the book to read it prior to making it the selection and to not depend on reviews or hearsay. That's interesting. So one person reads the book ahead of time? We’ve learned that nothing can take the place of actually reading the book first. It has also helped to have a facilitator who does some research, leads the discussion, and makes discussing the book a priority. I’ve heard that some book discussion groups start with good intentions but disintegrate into a girl’s night out or a dinner get together. We have embraced the idea of a girl’s night out and enjoy that aspect of the group. The food is always a pleasure but the book gets equal attention. Naturally, some discussions are better than others. As facilitator, I always attempt to include even the quiet members in the discussion. Over the years together, that has been less of an issue because we now all feel comfortable speaking up even if we disagree. Thank you so much, Ginny, for giving us a chance to get a glimpse of the wonderful Foster Book Group!